One of the challenges to getting a mini tree to fit into a landscape is that larger trees don’t always want to cooperate by standing up on their own. Unless you’re making a haunted house or a storm scene, having your tree falling into the side of the house is less than desirable. However, putting a planter around the tree not only keeps the tree upright, but it adds charm and makes the tree a focal point of your landscaping scene. 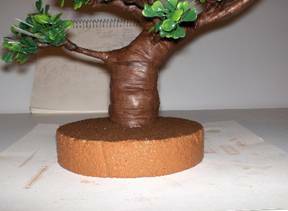 The hardest part of this mini project is finding a tree in 1:12 scale. 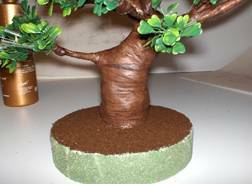 Surprisingly, a larger variety of inexpensive trees can be found outside of the normal miniature sources. 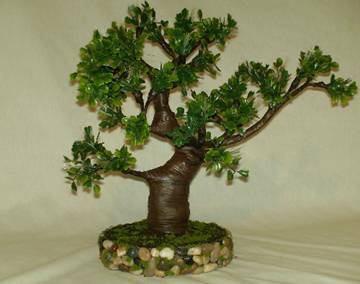 Gift stores that sell artificial bonsai trees are the best source since these trees are perfect for miniature landscaping. 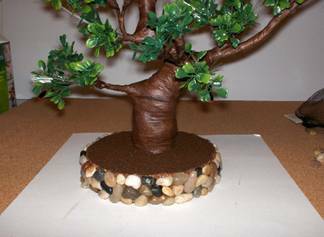 You can also check the floral sections of discount and craft stores, or look in thrift stores for centerpieces and coffee table art that incorporate trees. 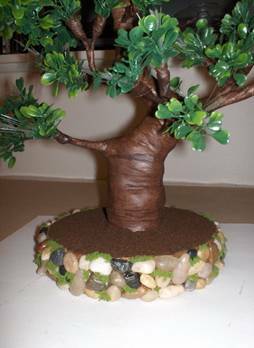 You can also make your own tree! Once you have found your tree, begin by hollowing out a hole in the florist foam just big enough for the base of the tree. Apply glue liberally on the top of the base and sprinkle coffee grounds over the glue. Tamp down firmly and gently shake off any excess, then glue the tree base into the hole. Paint the sides of the florist foam with brown paint. 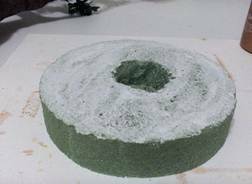 After the paint has dried, use a glue gun to apply the stones to the side of the foam. Place your stones as close together as possible. 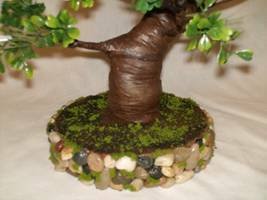 Using a toothpick, apply tacky glue into the crevices of the stones. Sprinkle coarse turf over the glue to create moss. You can also apply a little coarse turf over the coffee grounds if you’d like the surface of the planter to have a grassy look.